Plenty of rain and cheap oil mean manna for budget airlines. ‘Anything you can do, I can do better,’ might well be the tune Ryanair boss Michael O’Leary is whistling across the Irish Sea at easyJet today. After the Luton-based budget airline raised its full-year profit forecast 7% last week, its outspoken Irish rival has left it (vapour) trailing in its wake today. Ryanair raised its net profit forecast for the year to 31 March 2016 by 25%, from €940m to €970m (£686m to £707m) to €1.175bn to €1.225bn, as a washout summer in northern Europe and the strong pound got more people jumping on planes in search of sun. If it hits the top end of that range, the budget airline would fly in a 41% increase in net profits – not bad considering they soared 66% last year. The ‘scale of the upgrade’ meant it simply couldn’t keep it under wraps until its AGM in two weeks’ time, it said. The airline’s share price duly soared almost 7% to €13.83 in mid-morning trading, having already risen 72% in the last 12 months. ‘It’s clear that consumers all over Europe are delighted by and are switching to, our "Always Getting Better" (AGB) customer experience programme, our industry leading punctuality and our unbeatable low fares,’ O’Leary said triumphantly (sans the swearwords that punctuate his live missives). And certainly passengers have warmed to the mouthy chief executive’s acknowledgement that being nice to customers (not charging them to check in at the airport if they forget to do it online, for example) does pay. 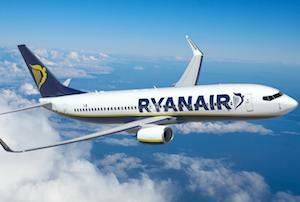 But O’Leary did admit that Ryanair had benefited from ‘favourable industry trends’ – the aforementioned strong pound encouraging British holiday makers to cross the Channel, soggy northern European weather, ‘flat capacity’ across EU airlines and, last but not least, lower oil prices taking a chunk out of its fuel bill.